Hello everyone and happy Friday! I hope you have all had an amazing week! I have been super busy with my Bullet Journaling for Beginners mini series on YouTube! It’s a seven day series and if you’re interested in Bullet Journaling, you should definitely check it out! Today, we’re talking about lists. Sounds a little boring, but let’s be honest, they’re essential. How many times have you gotten to the store, realized you forgot your list, tried to remember everything, but in all reality knowing you’re going to forget something. Trust me, I get it. I’ve been there. It’s more than frustrating. Lists literally save my life. Well, maybe not literally, but they definitely give me peace of mind. When I first started out on the journey of reorganizing my life, I used lists for everything. What I didn’t realize, was that I was actually doing a very minimalist form of a bullet journal. I would get to work in the morning, drink my coffee and make a list of the things that I needed to do. My day ended when everything was crossed off the list. That list anchored my day. As I moved into bullet journaling, I was able to easily transition into rapid logging for my daily pages. I was already basically doing it, there was just a little more structure to the bullet journal, with the keys and migration aspect. My bullet journal is full of lists. There’s shopping lists every week, there’s packing list each time I go on a business trip or on vacation. I have lists in my collections spreads of books, podcasts, movies, etc. Basically, lists make me happy. I’m sure this started when I was a kid. I remember my mom making lists in a simple school notebook for things to do throughout the day. And of course, the first thing on her list was always “make a list”. That way, when she got done with her list, she was already able to cross something else, making her feel that much more productive. With the advance of technology in the past decade, the ability to make different types of lists has also grown. For those of you who aren’t a fan of the analog system, there are tons of notes and list making apps for ios and android phones, and my personal favorite, Alexa. The Amazon Echo, or “Alexa” has the ability to create a list for you by simply talking to it. Then it can send that list to your phone. So while you’re cooking and you realize you’re out of butter, you just say “Alexa, put butter on my shopping list”, and easy as that, there it is. 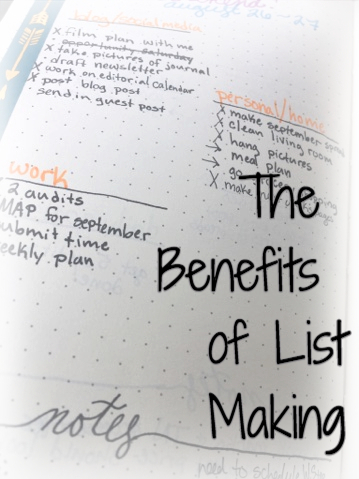 Are you a list maker in your daily life? Do you forget things that aren’t on your list?